As I mentioned in my earlier article, I ran into Carl von Schubert at the organic grocery nearby my flat yesterday. It was a coincidence, for I had just published that article ("The Big Get Bigger") not long before seeing him. He confirmed what I heard the day before, namely, that Maximin Grünhaus is a member of the VDP. Carl's grandfather had left the VDNV, a precursor of the VDP, because he deemed unnecessarily dogmatic their stance that all wines had to be naturrein, or unchaptalized. The VDP was formerly called Verband Deutscher Naturweinversteigerer (VDNV), Association of German Natural Wine Auctioneers, up until 1971. Today, the VDP's high-end dry wine, called Grosses Gewächs (GG), can be chaptalized, which goes against their own notion of "natural wine." Maximin Grünhaus has been following the VDP model. The Prädikats—which indicate unchaptalized wines—are only used for those Rieslings with more noticeable residual sugar now. Carl says that they only have to change a few minor things. Like rival VDP member Karthäuserhof before him, he already renamed his Spätlese trocken from the Abtsberg and Herrenberg vineyards to "Alte Reben trocken." The addition of Maximin Grünhaus to the VDP is great press for the association, especially after the departure of Koehler-Ruprect in October 2014 (see "Koehler-Ruprecht Leaves the VDP" for more on this). Moreover, the Mosel-Saar-Ruwer association of the VDP, better known as the Grosser Ring, regains a former member that has the requisite pedigree, along with large, priviledged, and contiguous vineyard holdings—all of which are monopole sites. 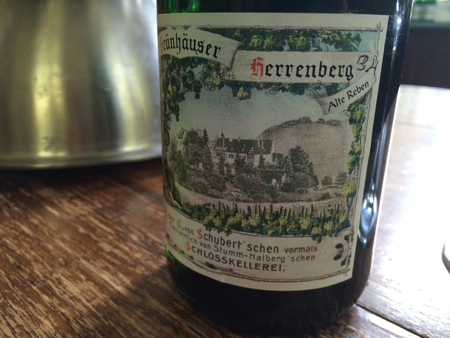 Abtsberg is already considered a "Grosse Lage," especially by those who back a Mosel vineyard classification. Grünhaus belongs in the Grosser Ring. What's missing are a number of other top-flight producers. Many of the current Grosser Ring members don't have the same high-quality wines of nonmembers, such as Markus Molitor, Weiser-Künstler, or A.J. Adam, to name a few. In this regard, the Grosser Ring, especially on the Middle Mosel, has been too conservative in adding new members over the years. I should add that neither Abtsberg nor Herrenberg is officially listed by the Grosser Ring as a Grosse Lage in their classification. Because Maximin Grünhaus is now a member of the VDP, these two monopole sites will surely be rated as grand cru. Zeltinger Sonnenuhr is not listed as a Grosse Lage either. Zeltinger Sonnenuhr is probably most associated with Molitor and Selbach-Oster, and of course, neither are VDP members. I’m sure that’s why it’s not listed as a Grosse Lage yet, quality notwithstanding. That’s true. But J.J. Prüm has a small, well-placed plot by the sundial in Zeltinger Sonnenuhr. On April 16, Renate von Schubert poured three 2015 Grünhaus wines at the fifth annual spring wine festival in Zurlauben. Johannes Weber and I had the pleasure to present a few 2015 Falkenstein wines next to her. When I asked her about the placement of the VDP logo, she told me that it would go on the capsules and screw caps.